Perhaps you, as I did, thought the age of traditional animation had come and gone. Most likely due to its poor critical reception and lackluster box office results, Disney's last feature release of this type was supposed to be HOME ON THE RANGE (2004). Thankfully, John Lassiter and Ed Catmull of Disney/Pixar had something to say about this. While they would continue to produce state-of-the-art 3D animated features, the 2D animation tradition would not be left to die. 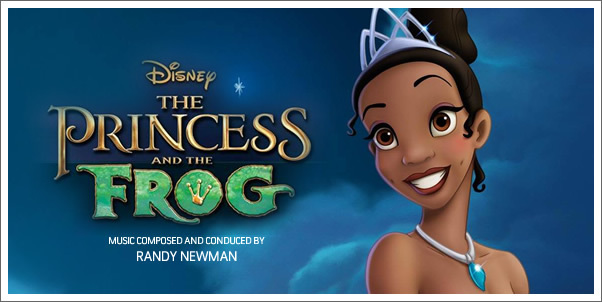 The first fruits of that decision is Walt Disney's 40th animated feature, THE PRINCESS AND THE FROG. This feature would return Disney to the fairytale spin-off, this time loosely based on the Brothers Grimm's THE FROG PRINCE, but bringing the tale to 19th century, New Orleans. There could hardly be a better composer for this feature than one RANDY NEWMAN. NEWMAN's association with Disney/Pixar goes back years; all the way to the first four Pixar feature releases: TOY STORY, TOY STORY 2, A BUGS LIFE, AND MONSTERS INC. And though none of these are among my favorite Pixar scores, Newman's trademark lazy-jazz-americana-sound infused a particular character in each movie as well as providing the blossoming 3-D studio with a good measure of audio-branding. In addition to his history with Pixar, NEWMAN also established himself within the world of the musical; among other things, adapting FAUST into a musical of his own. Now, if that wasn't enough, NEWMAN spent a number of his formative years in living Louisinana; something that clearly impacted his musical identity. While reportedly, Alan Menken was set to write the music for the feature and was later replaced, it's hard to imagine that anyone other than RANDY NEWMAN would even be considered. I think "When We're Human" captures that classic Disney sound of yester-decade. Don't know if it's something you'll listen over and over again, but you have an affinity for the music of Louisiana, you might. I think Newman and this film were a perfect fit and everytime I listen to the music I'm reminded of that.